World Food Day is October 16. Leaders from the United Nations’ Food and Agricultural Organization (UNFAO) will gather in Rome along with Agriculture Ministers from the G7 nations, leaders from the World Food Programme (WFP) and the International Fund for Agricultural Development (IFAD), and Pope Francis to celebrate the occasion, which commemorates the 1945 founding of FAO as the overseer of global food security issues. As FAO notes, World Food Day is also an opportunity to advance awareness and action on global hunger/nutrition initiatives and the need to provide food security for all global citizens. Created in 1979, it is a day to celebrate progress on reducing hunger and to demonstrate commitment to Sustainable Development Goal 2, which calls for ending hunger and all forms of malnutrition by 2030. We see World Food Day as a natural extension of FAO’s three major goals: 1) eradicating hunger, food insecurity and malnutrition; 2) eliminating poverty and driving forward social and economic progress for all; and 3) sustainable management and utilization of natural resources for the benefit of present and future generations. Those are goals we all can all get behind. 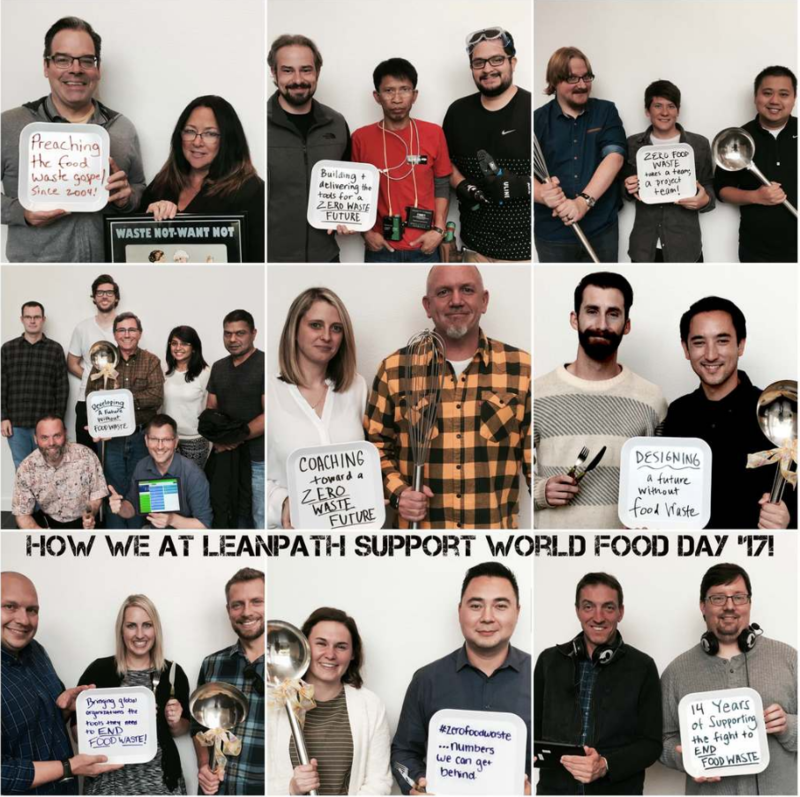 At LeanPath, we support the commitment to Zero Hunger and extend our applause to the World Food Day celebration. World Food Day matters, and we take it personally. We believe that food is precious, and that food has an incredible power to connect and unite people. Further, we believe that current levels of food wastage suggest insufficient valuation of food (and all of the scarce resources that go into producing it) as well as a missed opportunity to achieve social and environmental benefits that could bring people closer together. These beliefs drive our purpose at LeanPath: Our vision is to end avoidable food waste, and our mission is to make food waste prevention easy. By helping clients like Aramark, Sodexo, and IKEA track and measure their food waste, we enable them to make the operational changes necessary to achieve their 50 percent food waste reduction goals in support of UN Sustainable Development Goal 12 (Ensuring Sustainable Consumption and Production patterns) and, specifically, Target 12.3 (which calls for halving food waste at the consumer and retail levels by 2030). Shared commitment to driving significant global food waste reduction across the globe. Recognition that the success of the other Sustainable Development Goals is critically linked to successful food waste reduction and the creation of a sustainable food system. Prioritizing systemic food system change by focusing on upfront source reduction. Educating global stakeholders on food waste and the opportunities in prevention. Leading change to advance food waste prevention among global organizations. As a mom of three young boys and a lover of the beautiful nature that surrounds us here in Oregon, I’m inspired knowing that my work at LeanPath has a positive impact on protecting our precious resources—food, water, and energy--that will enable future generations to live a full life. Knowing that I wake up every day and have an opportunity to make an impact and prevent food waste is empowering. It’s important to remember that even a few ounces or pounds of food waste prevented here or there adds up and with LeanPath’s reach, we are making a difference globally. It feels amazing to be a part of the solution to a problem that touches everyone, every day, around the world. Food, and therefore food waste, is something everyone can relate to. Additionally, to work for LeanPath in such an exciting time, when food waste really has taken center stage on the agenda for companies and countries globally, is extremely rewarding. Reducing food waste is both symbolically in line with ending hunger and practically a big lever when it comes to carbon emissions. So that's what I'm working on – being a small cog in the wheel, pulling the big lever. For me, there were times in my life when I was food insecure – I didn’t know where my next meal was coming from. With one in six Americans facing food insecurity, this is something that most people have either experienced or know someone who has…Working on food waste issues is important for me because it’s impacted my life but I know that people want to and can take action. I can be the resource to help people understand how they can help and what they can do. I grew up surrounded by a family of dairy farmers in Central New York where times got tough over the years. They were instrumental in teaching me that nothing is truly waste and it all has a purpose. I find that the closer we are to our food, the more we value it, respect it, and understand the resources that go into creating it. Food is a precious resource. We are here to make a lasting impact in our world. Food waste prevention helps ensure that food is nourishing people, natural resources aren’t wasted, and we’re combating the critical issue of climate change. That’s why World Food Day matters to us, a lot.